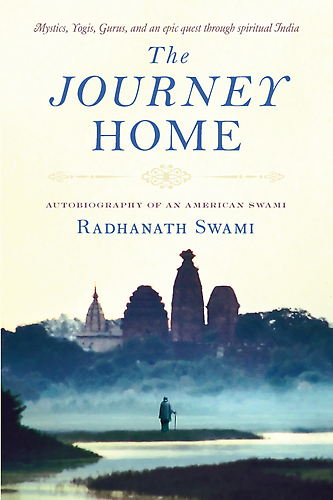 Question to Radhanath Swami: We learn that we should have faith on protection of Lord and thus we should be fearless. 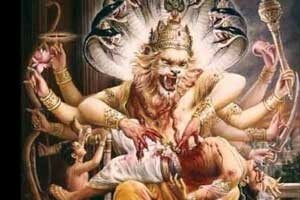 But we generally see that there is a practice, whenever we board a train or bus, at first we start singing Narsimha Arati or many devotees pray to Lord Nrsimhadeva for protection against impeding death. So how to interpret or support this practice? 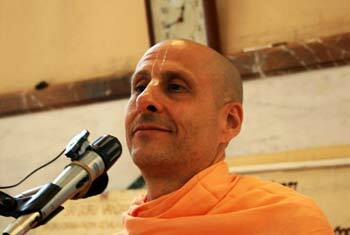 Answer by Radhanath Swami: One of our devotees was telling me that he is the member of the ATS, the antiterrorist squad. He is very sincere devotee. He said that for three days he was fighting the terrorists in the Tajmahal hotel. He was explaining the whole thing how difficult that was – they had these hand grenades throwing, and there was so much smoke, and they never knew where they were. They knew where you are but he did not know where they were because they kept the smoke and really good guns. He said, “In one point there was so much smoke and they were shooting.” They were shooting at him and two of his companions. He had a cellular phone. He had recorded on the cellular phone the prayers to Lord Narashimadeva because he realized he was helpless. It was just the cloudy smoke, he hardly knew where he was and there the bullets were coming; he did not know where to shoot. So he was playing the prayers of Lord Narashimadeva full volume of his cellphone, and he was chanting and praying to Lord Narashimadeva. When the smoke cleared people were dead. But the bullets whatever comes to him there happen to be a pillar in front of him. He did not even know, and all the bullets they would have to kill him went into the pillar. Lord Narashimadeva appeared from a pillar to protect Prahalad, and here He appeared as a pillar to protect this devotee. Even if he died, if he was chanting the holy names he would have gone back home back to godhead, which is much better than being in this place where there is danger at every step. Anyways, as long as we are in this place where there is danger at every step, we should access the love of god in our own lives so that we can be instruments of bringing people from fear to hope through assuring a new era of change.